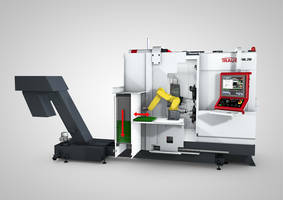 Universal Turning Machine features 2-turret design. Featuring open work area, vertical cast iron machine bed, and simultaneous machining by upper and lower turrets, Model IT600 turns parts up to 600 mm long and 380 mm in diameter. 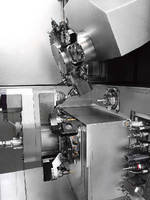 System is equipped with 65 mm spindle providing up to 352 Nm torque and speeds to 4,000 rpm. Controlled by FANUC 32i model B with 10.4 in. TFT color display, machine includes Intelligent Y axis that permits surface milling, off-center drilling, and off-center deep hole drilling. 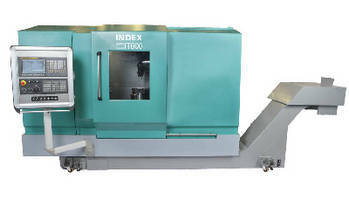 The INDEX IT600 65 mm universal turning machine provides a highly cost-effective solution for machining simple to complex workpieces, from small to medium batch sizes. Simultaneous machining by two turrets, upper and lower, combined with high rigidity and high torque spindle drive, result in high productivity machining. An open work area and the vertical machine bed offer extremely good ergonomics and permit fast setup of the machine for turning parts up to 600mm long and 380mm diameter. Users can expect excellent cutting performance with a 65 mm spindle with high torque to 352 Nm and speeds to 4000 rpm. The machine is designed for use in the automotive parts, mechanical parts and other general job shop assignments. The symmetrical machine design ensures optimum temperature stability for production. In addition, the machine bed is made of cast iron for maximum stability and rigidity. The arrangement of the tool carriers with CNC indexing axes, unique in this machine category, provides a very large work area, despite compact external dimensions of the machine. An intelligent Y axis permits surface milling, off-center drilling and off-center deep hole drilling. 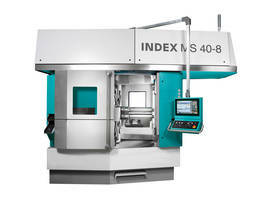 This Y axis is generated through the combination of the indexing axis of the turret, the C axis of the spindle, allowing driven tools to perform a range of operations in almost unlimited positions. 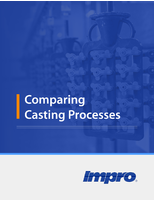 Users may select available multifunctional turret or programmable tailstock for shaft machining. The multifunctional turret permits internal machining plus tailstock function. Tool turret 1, the upper turret includes a 14-station VDI30 tool complement with up to 7 of the tools driven. For highly productive complete machining, the turret has an additional CNC indexing axis (A-axis) to assure concentricity of the tailstock center with the workpiece. 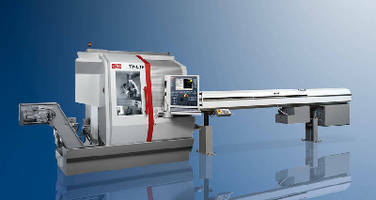 The optional multifunction 10-station turret for shaft and internal machining of holes to 330 mm includes a NC tailstock function and is mounted horizontally in the lower position. The X-axis of the tool turret also facilitates the tool setup. The IT600 is available with a wide range of handling capabilities, including an integrated receiving tray to an external loading gantry, depending on part geometry and batch size. Shafts to 1500m in length and 65 mm diameter and flange-type parts to 120mm diameter and 70mm in length can be handled automatically with an integrated receiving tray. The IT600 may also be gantry-loaded. FANUC control 32i model B is the ‘future-proof’ standard control with FANUC control panel with CNC keyboard, axis and spindle override, and 10.4" TFT color display. Electronic handwheel is integrated into machine control panel (standard).Memory for 72 part programs or more. For more information: INDEX Corporation, 14700 North Pointe Boulevard, Noblesville, IN 46060. Automatic Lathe features B axis for machining at any angle. Automatic Lathe features modular 8-spindle design. Sliding Headstock Automatic Lathe suits Swiss, production turning.